I was very pleased to hear a couple of weeks ago that the UK government plans to introduce a piece of legislation called the Modern Transport Bill. This may not sound very exciting, but behind the uninspiring name is the intention to ultimately establish the UK’s first commercial spaceports, from which space tourists as well as scientists will be able to fly into space – perhaps within as little as a decade. The costs of building will be funded by both central government and the commercial companies who would be using the facilities, and the project will not only boost the local economy of the area, through the creation of jobs and the income generation from future tourism, but would also raise its profile as a place of scientific importance. The most likely company to be able to offer short suborbital spaceflights, from a spaceport UK is Virgin Galactic, formed in 2004 by the British entrepreneur Richard Branson. As you may remember, Virgin Galactic’s ambitious plans suffered a serious setback in October 2014 when there was a fatal crash during a test flight. However, this was caused by human error rather than a fundamental flaw in the design, and I think we can still assume that Virgin will be the first to offer ordinary (but rich!) non-scientists the chance to join the tiny elite group of human beings who have left the earth. Long before their trip into space, the passengers will need extensive training to prepare them for the experience. They will need to spend time in a flight simulator and learn how to cope in weightless conditions, to lessen the dangers inherent in the ultimate flight. On the day, passengers will board the Virgin Galactic spacecraft SpaceShipTwo at the space port. 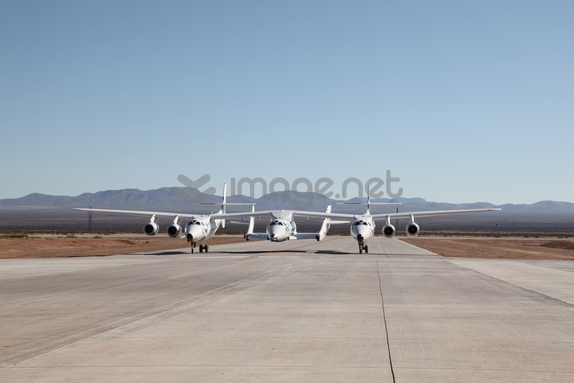 SpaceShipTwo will be attached to a rather strange looking twin-hulled carrier aeroplane called WhiteKnightTwo. After take off, WhiteKnightTwo will steadily climb to an altitude of 51,000 feet (15.5 km). This is about 50% higher than the typical height which a commercial aeroplane reaches on a long flight. From this altitude passengers will notice that the sky overhead will be dark blue because there is so little atmosphere above them. Also, because they are so high up, they will be able to see significantly further than they can on a normal jet flight, a distance of around 440 km to the horizon. When it reaches an altitude of 15.5km SpaceShipTwo will separate from WhiteKnight Two, and its rocket motor will then ignite. When this happens, the passengers will immediately feel a very strong acceleration, or g-force, which will pin them back into their seats. The force will be around 3-g meaning that a human would, while the rocket motor is firing, weigh three times as much as they do on Earth, making it a great effort to move any part of their body. 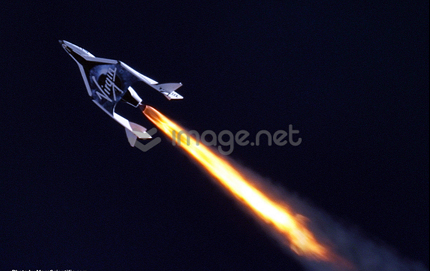 After only 70 seconds SpaceShipTwo will be travelling at 2,500 mph (4000 km/h). The rocket motor will then cut out and the passengers will suddenly go from being pinned to their seat by the strong g-force to being completely weightless. They will be able to get out of their seats, float around the cabin, look out of the windows and take in the view. The spacecraft will continue to coast upwards, being slowed all the time by the Earth’s gravity. After a further two minutes it will cross the 100 km boundary which is defined as space (see previous post for more details on why 100 km is defined as the edge of space). Its peak altitude will be around 110 km. If the passengers look outside the window at this point they will notice that the sky will be black even though the sun is shining. This is because there is so little atmosphere above them. They will be able to see about 1200 km to the horizon, so if it were flying over London, passengers would be able to see the Orkney Islands, off the North cost of Scotland, out of the window on one side and Barcelona, in Northern Spain, on the other side. After it reaches peak altitude the spacecraft will start falling back to Earth. Initially it will be in free fall but as it gets lower and lower and encounters traces of the Earth’s atmosphere, it will start to experience what is called ‘drag’, or friction, which will reduce the acceleration. The wings of the spacecraft, which are hinged, will tilt upwards, thus further increasing the drag and slowing the spacecraft down. The passengers will no longer be weightless and will need to safely get back into their seats, using the skills acquired in the pre-flight training. When the spacecraft descends to an altitude of 15 km, the wings will tilt back to their normal position, which will make it more streamlined, reducing the drag. The spacecraft will continue to gradually descend, gliding back to land on the spaceport runway. The first commercial spaceflights will almost certainly be from the only existing space port in the world, Spaceport America in New Mexico (http://spaceportamerica.com), rather than any location in the UK. No date has been set for the first commercial flights. To get a US Federal Aviation Administration licence to carry passengers above the 100 km line, it will need to have several test flights reaching its full speed and going above 100 km in altitude. No dates have been confirmed for these test flights, so I would not expect commercial spaceflights to happen before 2018. Flights from the UK are unlikely before about 2030, in spite of what Richard Branson says! On their website, http://www.virgingalactic.com, Virigin Galactic quote a price of $250,000, which must be paid in full and up front, just to secure a place on the waiting list. Passengers must be in reasonable health and fit enough to withstand the g-forces during the rapid acceleration. At this point there are already over 700 confirmed bookings, Brad Pitt, Angelina Jolie and Katy Perry among them. One reason why the price is so high is that Virgin Galactic need to recover their development costs of around $500,000,000. It is also a matter of supply and demand – the fact is that there are passengers able and willing to pay this amount, and initially Virgin Galactic will be the only company offering this service. At the moment there is only one single SpaceShipTwo in existence, VSS Unity, which was being built when VSS Enterprise was destroyed during in October 2014. The plan is to eventually have a fleet of five SpaceShipTwos, each of which will fly twice a day, from multiple locations around the world. When this happens – and as other companies enter the market – it is likely than the price will come down significantly. If Virgin Galactic were to charge $25,000 per ticket and to fly twice a day, 300 days a year, carrying six passengers, this would generate $450,000,000 in revenue. At this price a whole new market could open up and it might appeal to people of more limited means as the experience of a lifetime. Going into space is a risky business, and the technology behind SpaceShipTwo is unproven. The Space Shuttle flew 135 missions between 1981 and its retirement in 2011, and two of those mission ended in failure – with the death of all of the crew. The chances of a shuttle astronaut being killed on a space flight was therefore around 1 in 67. Until the technology becomes more established it is impossible to say what the risks of flying in SpaceShipTwo, but they will certainly be far higher than travelling in a commercial jet airliner, where the risks of dying on an individual flight are around 1 in 10 million. The fact that one person has already died and another was seriously injured in the aforementioned disastrous test flight of 2014 has not deterred Richard Branson, who still insists that he and his family will be on the first commercial flight. Sadly, I will not be joining them – not from fear, but from lack of the necessary funds! I hope you have enjoyed this post and once again would like to thank Mrs Geek for making it more intelligible! What a brilliant post. Fantastic description. Yes that price tag will.certainly exclude the vast majority of life on Earth. I wonder if Miss Perry will get to sing. All the best. I think that is exciting stuff. Love to be able to afford a flight. Fascinating–but an awful lot of fuel burnt for a ‘jaunt’ with no real destination other than’space’. Kinda like jumping off the bed to see what flying is like. In lieu of a ‘space elevator’ any time soon, this is just the beginning of commercial ‘space travel’ and not just for the seriously rich and their pleasure jaunts. Agreed–we’re gonna burn plenty fuel getting our starter material out of the gravity well–but once we get set up, we’ll be mining asteroids and what-not for raw material and we’ll only need to transport personnel up and down. But a space elevator, once the materials science gets there,is definitely optimal. If given the opportunity, I would go. But, opportunity includes $$$ and time. By the time my name came up, my $$$ would probably not even be close. I think, for the reasons outlined in the post, although the price tag is currently $250,000 for a short suborbital hop into space in future this will fall. Perhaps, by the early 2030s, as more companies enter the space tourism market and Virgin Galactic scale up their operation it will be around $25,000. Although this is still a huge amount of money to most people. Reading your post was a space trip for me and I enjoyed the exploration immensely. This is a really exciting article! Scifi books really predict the future in ways we can’t even imagine, in my opinion. If you have any time, please check out our blog where we post up-to-date amazing research being performed by Rutgers University every day. Thank you!